Rabbi Yosef Lipsker was born and raised in Brooklyn, NY and received his rabbinical ordination from Central Lubavitch Yeshiva, Brooklyn, NY. Currently providing services as a Chabad Rabbi, Rabbi Lipsker performs all pastoral duties and leads community members through all life cycle events. He is very involved with community outreach and other local Jewish organizations, arranges numerous family events and provides religious and personal counseling. He currently serves on the Board of Directors of the Reading Jewish Federation, is a counsultant ot the Caron Treatment Center for Substance Abuse and Chemical Addiction and is a visiting chaplain at Reading Hospital, St. Joseph Hospital and Berks County Prison. While completing Rabbinical and post-graduate Studies, Rabbi Lipsker spent two years in Sydney, Australia,as a student Rabbi, organizing lectures, programs and retreats. 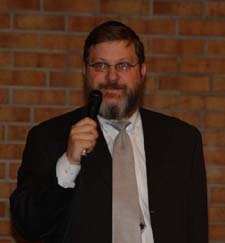 Prior to settling in Reading, Pennsylvania, he worked for Chabad in Connecticut, England and Florida establishing youth clubs, adult education classes, administrating a boys high school, performing life-cycle events and developing unique programs tailored to the needs of each community. Rabbi Lipsker and his wife Chana together with their family have conducted years of highly successful programs in Berks County and beyond, drawing on every segment of this diverse community. The Rabbi also offers a weekly class relating Judaism and addiction recovery each Thursday evening in the Philadelphia suburbs. For more information and to contact Rabbi Lipsker click here.